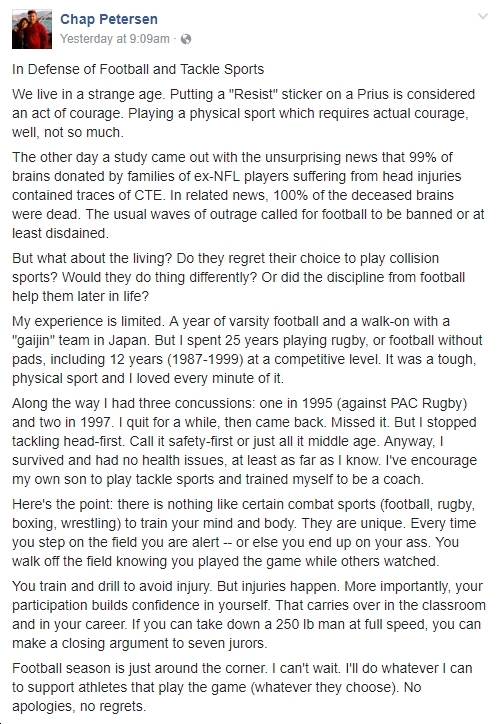 I’ve been reading a bunch of articles recently about the relationship between contact sports like football and CTE [chronic traumatic encephalopathy] — “the degenerative brain disease that causes memory loss, confusion, depression and dementia.” Yesterday, I also read this…uh…we’ll just call it a “rant” by Virginia State Senator Chap Petersen (founder of the “Redskins Pride Caucus” – yes, that’s an actual thing, believe it or not – in the Virginia General Assembly). …it’s a very tough question, and the reason being is, we know there’s a lot of benefits associated with playing sports and participating in sports. But this study and our findings, they raise a lot of concern. But we need to do more future research. We need to know more about the disease, more about the risk factors for the disease before we can really make any informed recommendations about policy or about safety. We need to learn more. For those of us (myself included) who love sports, including sports where you get repeated blows to the head – e.g., “football, ice hockey, rugby, boxing, soccer (by “heading” especially), and wrestling” – this is, or at least should be, worrisome. Obviously, sports provide enormous benefits in many ways, but if a large percentage of participants in particular types of athletic activities end up with CTE, is that acceptable? I’d note that, in addition to the potentially enormous risks to people’s long-term health and well being, there’s also another big risk to schools and others who sponsor/host/etc. the types of sports that might result in high incidences of CTE: liability (bolding added by me for emphasis). Concussion lawsuits, originally the province of the NFL, have been filed against high schools and colleges. Public school systems have been sued and judgments entered against them. …Most states will not allow a parent to contractually waive a minor child’s right to sue for a sports-related injury. Only 10 states, including Ohio, allow parental waiver/releases…This means Pennsylvania school districts cannot avoid liability with parental waivers. According to the journal Neurotrauma, post-mortem evidence indicates that damage to the brain results from repeated trauma to the head, even when the player fails to show clinical symptoms. Players who have never had a true concussion could suffer neurocognitive and neurophysiological injuries. Chronic trauma encephalopathy has been proved to have resulted from repeated head injury. The physical manifestations of CTE are a reduction in brain weight with atrophy of the medial temporal lobe, the frontal and temporal cortices, the brainstem, cerebellum, hippocampus and other parts of the brain. These changes cause severe mental confusion and depression. Recently an Ohio State football player apparently committed suicide after experiencing the symptoms associated with repeated concussions. Junior Seau, the All Pro player, died in a similar fashion. The bottom line is that no matter how much you love contact sports, this is serious stuff, requiring a serious response. Which is exactly what we do NOT get from Virginia State Senator Chap Petersen (D-Fairfax) in the following Facebook tirade (see screen shot below) he posted yesterday. It’s hard to even know where to start in critiquing this hyper-macho blather. How about the concept that “there is nothing like certain combat sports…to train your mind and body?” Uh, evidence for that statement? Or that “if you can take down a 250 lb man at full speed, you can make a closing argument to seven jurors?” Again, any evidence for that? Or the gratuitous, Limbaugh/Hannity/Trump-style slap at those “putting a ‘Resist’ sticker on a Prius?” Gack; with “Democrats” like this, who needs Republicans??? I ran these spewings by an area School Board member, and their response was, “if the evidence is clear and compelling that football as currently played causes brain injury, we will have to make it safe or prohibit it.” Is that a “no brainer” (bad pun intended) or what? Seems like it to me. But then again, I’m the type of person who: a) respects and listens to medical professionals and scientific experts in general; b) played a contact sport (floor hockey) for years; c) nonetheless thinks we need to adjust our policies/practices to new evidence as it comes available; and d) encourages everyone to drive more environmentally friendly vehicles (e.g., a Prius) AND to “resist” the unhinged tyrant in the White House — including with a sticker on your Prius. 😉 To quote Chap: I make “no apologies” and have “no regrets” for any of those things. Previous articleHow About Renaming J.E.B. Stuart High School to Barack Obama High School?